For I am planting seeds of peace and prosperity among you. We yearn for a display of Your splendor–people throughout the population of West Africa established like oaks of righteousness. In a good year, an oak tree produces between 70,000 – 150,000 acorns. O, for hundreds of thousands of seeds of righteousness, peace, healing, hope, and prosperity throughout Liberia, Sierra Leone, and Guinea! With You, nothing is impossible. Let it be! Amen. Compassionate and Loving Lord, we want to give thanks and praise for all the amazing doctors, nurses and volunteers who are helping to bring the Ebola crises in Guinea, Liberia and Sierra Leone [and Mali] under control. These are the unsung heroes and heroines who are working tirelessly, in enormously difficult circumstances, to help the citizens of these countries. Thank you for our soldiers who are now helping in Sierra Leone and for the charities, especially Medicine San Frontiers and Red Cross, who have been there since the outbreak. We pray for all the families who have experienced the loss of loved ones and especially for the children who have been orphaned. We pray that they will get the help and support they need to rebuild their lives. Lord, in your mercy, hear our prayer. Pray that the millions being targeted with potentially life-saving advice would be receptive and that it would prevent them contracting Ebola. Pray for the medical teams across the nine districts receiving disposable gloves, powdered and liquid chlorine for disinfection. Pray that they might be prevented from contracting Ebola. Pray for the 900 community health volunteers conducting door-to-door awareness raising and training 9,000 more volunteers. Pray that through their work others would be prevented from contracting Ebola. Pray that the widespread fear and distrust about the disease and its causes would be dispersed and that through reassurance and support many would be prevented from contracting Ebola. Pray for Christian Aid partners in Sierra Leone: the Methodist Church of Sierra Leone (MCSL), Network of people living with HIV, the SEND foundation, Rehabilitation and Development Agency (RADA) and Network Movement for Justice and Development (NMJD). Give thanks for their witness. Pray for courage and hope for them as they reach out to communities in 10 of the country’s 14 districts, pray that through their work many would be prevented from contracting Ebola. Pray for all those putting themselves at risk to treat patients. Pray for those who are the patients, for their recovery and cure or for a dignified and peaceful passing for those who do succumb to this disease. Pray that the international community would make resources rapidly available to respond to the challenge of Ebola. in the darkness of the Ebola Crisis. for those who have survived. to live among their families and communities. among those who are afraid. full of the grace and truth that blesses all flesh. in the body of humanity that has Ebola. their own comfort and security to tend to the needs of others. There are still more prayers at the full page. Ebola still increasing in Sierra Leone – pray! The Ebola situation continues to get worse in Sierra Leone, which is averaging nearly 100 new cases per day throughout the country according to yesterday’s WHO report. 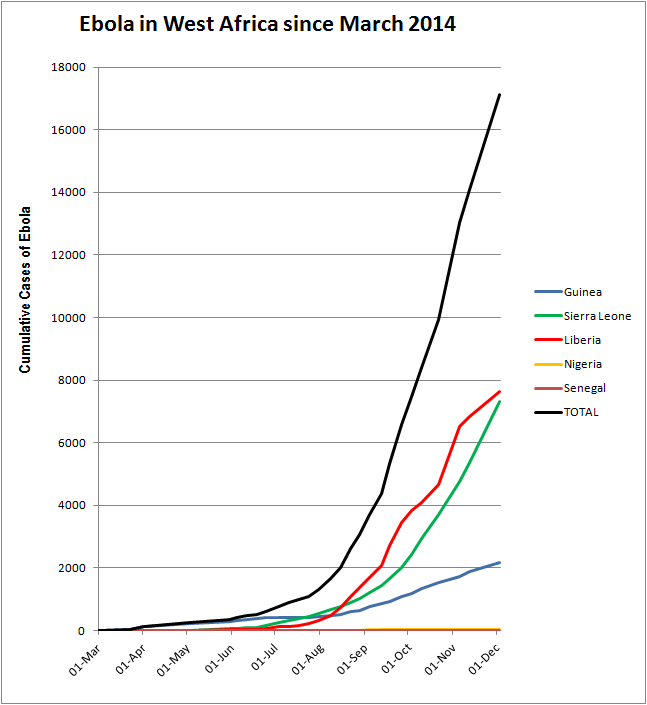 As our latest graph below, tracking cumulative cases in West Africa shows, total cases in Sierra Leone are likely to soon surpass the cases in Liberia, where thankfully there has been some slowing in the numbers of new cases in the past 6 weeks. The graph shows that there can be no let up in the sense of urgency about Ebola in West Africa and that much perseverance in prayer is still needed! And yet now that there are currently no Ebola cases in the U.S. or Spain, the crisis risks getting bumped out of the headlines once again. I found the following prayer at the Catholic Relief Services website. I love the idea of contagious compassion! May the Lord cause our hearts to respond to this crisis with prayer, with giving and with acts of love and service n whatever form we can offer. Support for all health workers who risk their own lives to care for others. so that we may generously respond as you would. You’ll find all our Ebola Crisis prayers using this tag. I urge you all to not only PRAY, but to GIVE and ACT as well. The New York Times published a good list of charities on the frontlines of the battle against Ebola. From personal experience, I have a lot of confidence in the work of Doctors Without Borders (aka MSF) and Samaritans Purse. I may try to do some research regarding which charities are most active in Sierra Leone, so as to be able to focus specifically on alleviating the crisis in that country. If any readers have information, please let me know. I lift my eyes to you, O God, enthroned in heaven. We keep looking to the Lord our God for his mercy, just as servants keep their eyes on their master, as a slave girl watches her mistress for the slightest signal. You are enthroned in majesty and glory in heaven. The heavens are yours; Liberia, Sierra Leone, Guinea, and Mali are yours; the world and all that is in it, you have founded them. You have a mighty arm; strong is your hand, high your right hand. Righteousness and justice are the foundation of your throne; steadfast love and faithfulness go before you. We lift our eyes to You, O God, for Your mercy in the Ebola virus epidemic. Amen. It is interesting how many of the verses of the famous Advent hymn are fitting for the Ebola crisis. When the Israelites arrived in the land, they set up the ancient wilderness tent shrine (the Tent of Meeting) in Shiloh and there Joshua divided the land among the tribes. Subsequently, Shiloh became the capital of Israel before the first Temple was built in Jerusalem. The Tent of Meeting was in Shiloh 369 years. Shiloh means place of rest. The word Shiloh is also generally understood as denoting the Messiah, “the peaceful one.” Today, the community Shiloh is surrounded by farms and vineyards. Jesus, You are “the peaceful one.” You are our place of rest. In You, we live and move and have our being. May the fruit of Your presence be abundantly manifest in the lives of the Christians in Mali, Sierra Leone, Guinea, and Liberia. Shalom over the Christians in these nations, Lord. Shalom! Shalom! Shalom! Amen.